If in the past, men like Duke of Windsor, Cary Grant, Fred Astaire, the Kennedy or Giovanni Agnelli set the trands in matter of elegance. The trendsetters of today are the international designers and young actors and artists. Think about the architect Rem Koolhaas, or Jeremy Irons, mixed with the street rappers. Many of them are propositional toward a new and intelligent way of dressing that needs to be elaborated and customized in the details…and go on, the new dandy people like Manfredi Della Gherardesca or the young generation from good and noble family like Raphael Abascal Medina Duke of Feria who has attitude and elegance since they were born…or people from fashion system like Mario Sorrenti. Denim jeans: Levi’s 501 col. White or denim. I build my daily look around? How they match the colors and the proportion of the items they are wearing. The birth of fashion stylist and designers in the 80s and 90s had totally changed the way of thinking: Fashion shows started to set the rules, men became more “fashionist”. It’s not like that anymore. I seem to feel embarrassed in wearing fashion clothes; I claim my own role, reviving the value of men’s clothing embellished by personal researches, never banal nor ridiculous. I don’t want to be fashionable; I want to be admired for my style…Sartorial and customized style! 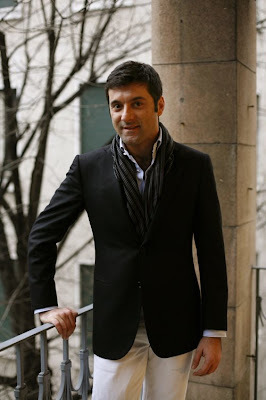 Comments on "Style Profile...Dario Spadea Pandolfi, Milan"
The gentleman has style. The interview/profile format is one that works well. Cheers. His style is charming...very old hollywood. Is this a new thing? LOVE it! My God, where do you find these people who are dripping in gorgeousness and style? Thanks for sharing your creativity and energy! The jacket in the second photo is great and he look very elegant but juvenile. Love his style. And thank you for bringing the style profile feature back to the blog! Only one thing: Rafael Medina Abascal (no Raphael Abascal Medina)isn't the Duke of Feria, was his father who is death. Saludos! Look at all that blue in the first photo! It's official. I love this man. Second picture is quintessential Italian style: the fit of that jacket, the sleeve length and shirt cuff are pin-point accurate. I agree with him about Rafael Medina. He is probably the smartest man in Spain. He knows what to wear in every occasion not matter if this is formal or casual. I love reading these stylish interviews! Absolutely love the photos - the blues even match with the background! - & it's definitely good to know that there are still men with class around now-a-days. My father also taught me that elegance is a whisper, I could see the look of pain in his eyes at some of the outfits I put together as a child. Who polishes these people's shoes, do they have servants? I adore him! Yay for horseback riders (we have something in common) and stylish men! I really love these interviews! I always always love your Men from Italy shots. It's just undeniable- they have a unique style and elegance. And I absolutely love the bit about "The elegance is something that must be whispered and not shouted…"- it's simply precious! Great jacket sleeve, shirt sleeve length in picture two. What shoes did he pair up with the white jeans and the black blazer? Great job - thanks so much for re-instituting the interviews! They have been missed. Hooray for the return of the Style Profile! I think it should be mandatory for anyone who appears more than twice on the Sartorialist. Even if I don't care for the look I enjoy hearing more about them. Well done Sart: He says street rappers are a style influence and you post two of them the same day to prove that point. Eryl Shields, my guess is he might wear his shoes a bit rugged, a bit durty. Not a problem at all! This is wonderful, thanks Sart! I love these style profiles! Maybe you could do one of someone a little poorer, a student perhaps? Please more of these interviews! So much inspiration! These man has a very realistic approach to fashion, to elegance, to life. Much like your blog. I don't feel it's out of my realm (like that feeling you get when you watch the Oscars). Outstanding work! Another fantastic profile. Thank you. i highly agree with him about socks being underrated. What color shoes did he wear? And is he wearing white Levi 501's? What a wonderful addition to the blog this is! Style Profile..,Sart having a Q&A with the ones he admires! This gentleman has a wonderful elegant style and an elegant manner...a rare combination now days! I am loving the blog as you all might have noticed! Two very well constructed outfits. He knows what he's doing. I want to know everything about him! He's so brilliant! 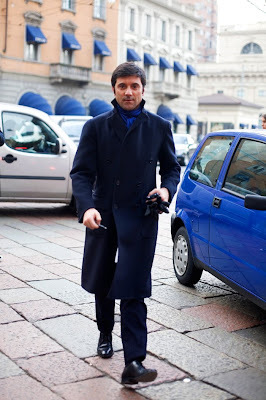 Speaking about Rafael Medina..he is really elegant...but he needs to meet Dario to discover Cesare Attolini's style! I agree with Dario...Jeremy Irons is the perfect man of TODAY! Dario you are simply the best! love his grandfathers/fathers quote and the pics! These are great. You have to do more of them. For me, Fred Astaire will always be a timeless style icon. Anyway, very interesting read. I feel overwhelmed by your vast experience and knowledge. very nice these interviews but gosh is this man old fashioned.. all about the right DNA , old money, a bit old fashioned n'est pas ?? Style doesnt come with birth but with intelligence and curiosity and of course exercise and emotion, attitude and creativity, which is available for anyone open for experiences. I do like a lot this kind of mini style interview they are so informative !!! To anonymous below. Precisely because the father of Rafael Medina died, he is now the Duke of Feria. Titles tend to be inherited, that's the thing about them. the fit of his jacket in the second photo is perfect. i love the striped scarf against his srtiped shirt. i tend to love old-world elegance and glamour so even if he seems a bit old fashioned to some it works for me. i want to be him when i grow up. Oh God! I knew Dario was special...Mario Talarico in Naples is a fantastic experience! He is handsome. I love the way he pulls off the outfit. This guy is one of my fashion role models. No doubt about it, the Italians dress the best.